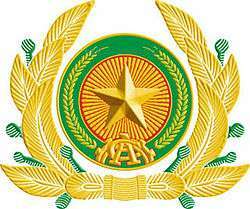 The Vietnam People's Armed Forces (VPAF) are the armed forces of Vietnam. It consists of 3 components: Vietnam People's Army which is the military forces of Vietnam, Vietnam People's Public Security which is the security force of Vietnam and Vietnam Civil Defense Force which is the militia of Vietnam. The People's Army of Vietnam(Vietnamese: Quân Đội Nhân Dân Việt Nam) is the army of Vietnam. The PAVN includes: the Vietnam People's Ground Force (including PAVN Strategic Rear Forces), the Vietnam Border Defense Force, the Vietnam People's Navy (including VPN Marine Corps), the Vietnam People's Air Force, and the Vietnam Coast Guard. The Vietnam People's Public Security (Vietnamese: Công An Nhân Dân Việt Nam) is the security and police of Vietnam; it includes the Vietnam People's Police Force and the Vietnam People's Security Forces. The Vietnam Civil Defense Force (Vietnamese: Dân quân Tự vệ Việt Nam) is the militia of Vietnam.